U.S. defense company Lockheed Martin has delivered its first batch of Long-Range Anti-Ship Missiles (LRASM) to U.S. Air Force B-1B Lancer long-range strategic bomber units following the achievement of early operational capability (EOC) of the new weapon system, the company said in a December 18 statement. The U.S. Air Force and Lockheed Martin last successfully test fired two production configuration LRASMs from a B-1B over Point Mugu Sea Range in California in May. A previous test launch of an LRASM, officially designated AGM-158C, took place in March 2018. Prior to that, the last test occurred in December 2017, which involved two LRASMs fired from a B-1B hitting a moving naval target. The LRASM began as a joint research project by the Defense Advanced Research Projects Agency (DARPA) and the U.S. Navy in 2009. The aim of the LRASM project was to deliver a new generation of anti-ship missiles with standoff capabilities — in other words, missiles with extended range, which would enable ships and aircraft to launch the weapon without being exposed to enemy counter fire. According to Lockheed Martin, the subsonic LRASM has an estimated range of over 320 kilometers and is fitted with a 450-kilogram penetrator and blast fragmentation warhead. 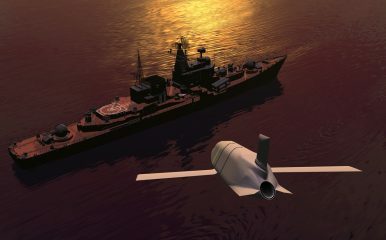 The LRASM is part of the U.S. Navy’s “Distributed Lethality” concept of operations and is expected to complement two other anti-ship missiles, the RGM-84D Harpoon Block 1C and the fifth-generation over-the-horizon Kongsberg Naval Strike Missile (NSM). LRASM is on schedule to achieve EOC on the U.S. Navy’s F/A-18E/F Super Hornet in 2019. U.S. defense firm Lockheed Martin successfully hit a moving ship with two long-range anti-ship missiles during a recent test.